Though a pretty golden shimery eye is the most flattering thing, it should stay for special occasion. The most appropriate eyeshadow look for daytime is down to a matte eye or nothing. In the workplace, your are a not supposed to look like disco balls, save it for party time. 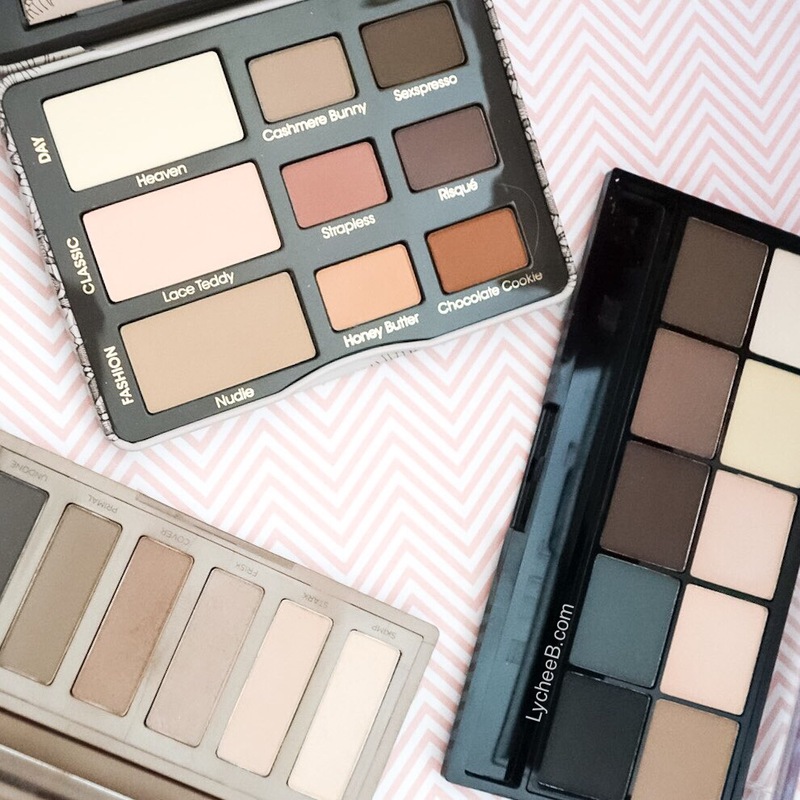 Most eye-shadow palettes are a mix of both, and I am not always convinced. The most traditional of mattes palettes are the Naked Basics 1 & 2 (here is displayed the second one) – if you love extremely natural palettes these are for you. They may sometimes look a bit boring (don’t quote me on that) but it is an easy peasy palette when you don’t want to think about crazy eye looks. I find MUA’s matte eyeshadow to be very good especially when you consider their price points (£4 is a bargain). I went already went through 2 of their Fudge single shadow and I just cannot stop using it. Their matte palettes are interesting. You can choose whether you want it natural (consider trying the shade Ever After ) or with more colour (The Winter Forest Matte palette is for you) – the dark navy blue shadow is to die for if you can pull it off (as a liner maybe?). But the star of the show and the reason I looked to write this post is the Too Faced Natural Matte palette (which is not as natural as you think it might be) – I had back experiences with Too faced shimery shadows, this palette doesnt seem to dispoint. Perfect to keep in rushed morning make-up stash ! !